You are celebrating your 50th stage anniversary this year, what are your favourite memories from those 50 years? 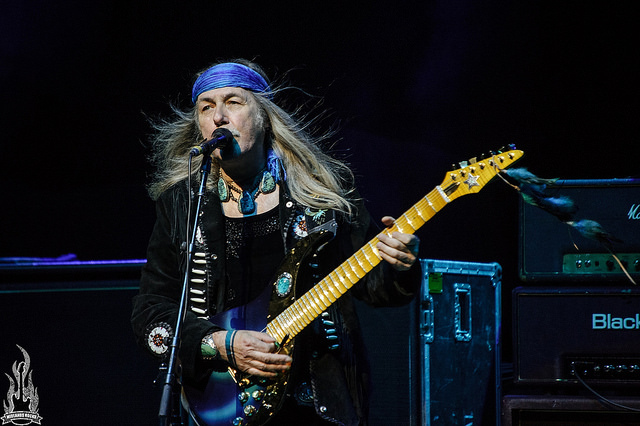 Uli Jon Roth: I certainly have a lot of good memories – but also some that are less good – from all those years of touring. Some stand out more than others, but I don’t really have any favourites as such. I see it more as a contiguous journey which had its fair share of peaks and troughs. Some concerts stand out more than others and then there are those that you never forget… Those include the best shows and the worst, which one does best to forget, ha-ha. Unfortunately, these do happen every once in a while, but luckily this is very rare and usually due to technical mishaps. What are you looking forward to most when touring the UK in December? Uli Jon Roth: The programme! We will play a large cross section of my very best stuff from those 50 years and a lot of that I have not played for years. I’m looking forward to playing those songs again, including some new ones. Uli Jon Roth: Not sure. When I was a kid, it was definitely Jimi Hendrix’s show in Hamburg, 1969. Uli Jon Roth: None whatsoever. I don’t believe in rituals, because I don’t like to experience repetition. I always like to make things up as they come and adapt to circumstances in a flexible manner. That’s why I like improvising, because I don’t know what comes next. I also don’t like to watch the same movie twice – no matter how much I enjoyed it the first time (Having said that, I have watched some movies more than once). Since shows are often late and I get tired a lot on these tours, the closest thing to a pre-show ritual would be that I try to take a quick cat nap before I go on stage whenever I can. This simple procedure ensures that I’m fresh for the show and it’s much more effective for me than any warm-up exercises and such like. I have never had any warm up routines before shows. I just grab the guitar and start playing. It’s like a Pavlovian reflex. As soon as I touch a guitar, something happens with me and it’s like someone turns on a light switch. It connects instantly and without fail. Uli Jon Roth: Again, there’s no set routine. I might try to take it easier than on show days. I love taking walks alone in strange countries and cities of the world. Very interesting to soak up the atmosphere and to become aware of the vibes of a place and its people. I get fascinated by figuring out in which ways they differ from one another and in which ways all people are alike. Uli Jon Roth: On tour? That would be my cell phone and my laptop. They are my two faithful assistants and this way I can stay on top of things in Uli land, which is sometimes not such an easy thing to do, because I tend to have a lot of diverse things on my plate most of the time. I try to manage my time wisely – meaning I prioritise things. On tour, this is especially important, because so much is going on which dictates one’s flow of time. Again, the cell phone (of which I have several) and laptop(s) are incredibly useful in saving time. If one knows how to do it and how to really use these gadgets, they are extremely powerful tools when touring the world – especially in foreign countries and when one is on one’s own. 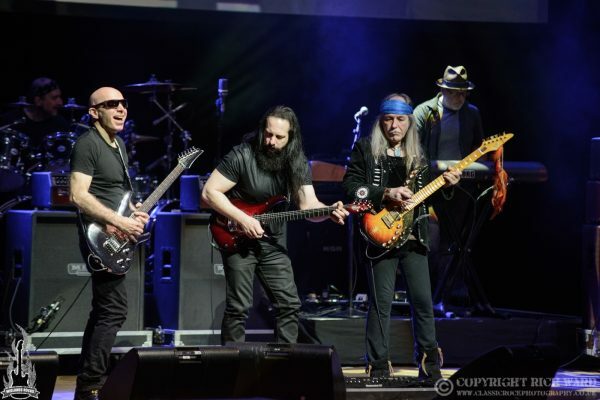 Earlier this year you toured the UK and Europe with Joe Satriani’s G3 along with John Petrucci. Please can you tell us a bit about the tour and what you liked best about touring with Joe and John and the whole G3 Experience? Uli Jon Roth: We all had a great time! It was a very enjoyable and very successful tour in more ways than one. We all got on so well, both on as well as off-stage. Joe Satriani and John Petrucci are both great players and lovely people. I hope we will do this again one day. You recently launched the Sky Guitars website. Please can you tell us about the new guitar models and what you are trying to achieve with the new range of guitars. Uli Jon Roth: I’m very excited about this venture! We are building a whole new range of Sky Guitars – each one with different features – and I’m going to showcase several of them on this tour for the first time. What can your fans in the UK expect to see and hear on this tour that they’ve never experienced at an Uli Jon Roth concert? Uli Jon Roth: I hope that these will be my best and most comprehensive shows so far. I’m trying to present the distilled essence of my 50 years’ journey of live performances, which was and still is quite a trip in itself.